We welcome your calls to book appointments and to address your questions and concerns. Please, use our e-form below for general inquiries only. Our staff will respond promptly. 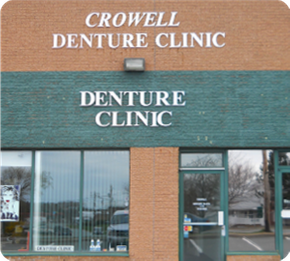 Conveniently located in the Woodlawn Shopping Centre in Dartmouth, Crowell Denture Clinic Ltd. has plenty of free parking and is wheelchair accessible. Visit us during business hours or call us for after-hours emergency repairs.